For those who prefer the simplicity of a self-powered subwoofer, there's the JRX118SP. 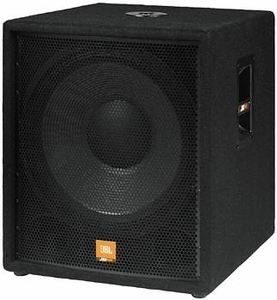 JBL started with the same woofer used in the non-powered JRX118S and added a specially designed amplifier with 500 watts (peak) and 300 watts (continuous) power output. Dual inputs with balanced XLR connectors. A built-in stereo crossover network - great for systems with EON or other powered satellite speakers. Peak limiter that protects the amplifier and speaker from clipping.